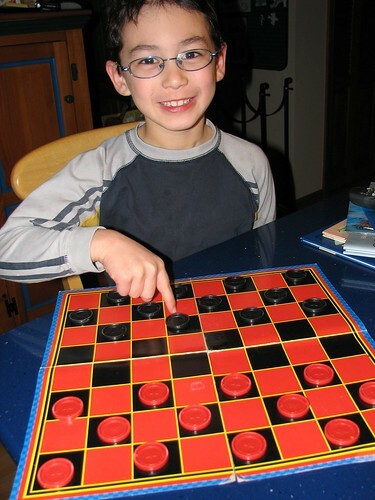 One afternoon after I picked Adam up from a playdate, his friend's mom told me that Adam was an incredible Checkers player. I hadn't played with him in a year or so, and his playing was still a bit shaky then, where I had to show him opportunities and mistakes as we went along. She told me that he was beating her son who was just a beginner so she had to take over. She said that Adam completely analyzed and dominated the entire board and was quite impressive. I had to take her up on her assessment and try a few games with him myself. During our first game, I only half paid attention and he quickly beat me. The next game, I gave my full attention and found myself backed into corners and having to spend long minutes trying to find a winning strategy. I had to use my full concentration and took twice as long as he did for each move and he still won. No stalemates are allowed with him, he wipes you clean off the board. Now, I was impressed! So I upped my game (after all, you'd think I'd have a leg up on a 7-year-old, he hasn't gone to MIT... yet) and finally beat him. But it took all my concentration and energy. In the last game I played with him recently, he allowed me two redo's (showing me my lack of judgment and allowing me a different move) and he still won with no redo's. We've played chess a few times, but I am not a great chess player (although I can still beat him every time), and he prefers the deceptively simple yet brutal rules of checkers. Now good as he is, he is an incredible sore loser. As soon as he senses that I am winning, he'll start screaming and throwing pieces and whine that he doesn't want to play anymore. Often it is too early to tell who will win, but his emotions get the best of him. I suppose good gamesmanship will come with time and some more coaching. In the meantime, he enjoys winning and sometimes allows mom to win a few.